The rules are pretty simple: spend no more than $4 per person, per day for your entire food and drink budget (that's $56 for us for everything we eat for the next week). On top of that, consider the conditions someone really living in poverty would be dealing with. That means no going over to your rich uncle's place for a big steak to stave of your hunger mid-week, no using your sous-vide cooker thingy, and no saving money by getting "free" produce from your big suburban garden. As we found out last year, it's difficult, but very doable, provided that you watch your portion sizes, eat mostly vegetarian, and spend some serious quality time with an Excel spreadsheet. Although this year there is a bonus. Not only is the allowance still $4 (it was raised from $3 as a temporary part of the 2009 economic stimulus package) but the food bank is allowing participants to include some of the fresh fruits and vegetables that people in need can get from neighborhood grocery pantries across the city. It's going to be a great help! Our menu for the week follows (check the next post for the shopping list and budget breakdown.) We decided to create a Chinese menu for the week, which will allow us to save money on staples (got rice? ), have more interesting vegetarian options, and make use of the extremely inexpensive offerings at the Manila Oriental Market, a huge Chinese supermarket near our house. Also, we've got a strong repertoire of robust, inexpensive, Hunan/Sichuan dishes that should nourish our bodies and bouy our spirits! For Lunches we'll create mostly vegetarian bento boxes with rice, stir-fried vegetables and the following: Corned Beef Hash, Tofu Scramble, Spicy Cold Noodles, Chickpea Curry, Pounded Eggplant and green peppers, and mini cabbage rolls. Check back everyday for recipes, shopping tips, and musings. This looks like a great menu - can't wait to see the recipes! 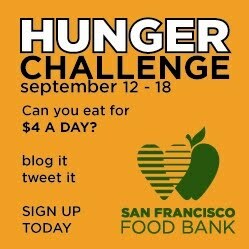 We really appreciate all your support and your willingness to take the Hunger Challenge! We look forward to your recipes; the menu looks delicious and we love the “money on the line” idea! Best of luck this year. Thank you!